It seems as if the days are flying by and of course they are. I'll post a Sunday scripture and the next thing I know, three weeks will go by in the blink of an eye. I've been busy sewing for market, getting caught up on other quilting and I managed to squeeze in a trip to Georgia to see my brother and his family with my niece and great nephew. I can't stay focused right now and I'm blaming the weather which can't seem to stay focused either. I sew awhile, then knit awhile, then read, then stitch. I'm constantly bouncing around but somehow I manage to get things done. My latest antiquing discovery was this little button box with the sweetest colors. So much to do, but I'm itching for an adventure, how about you? 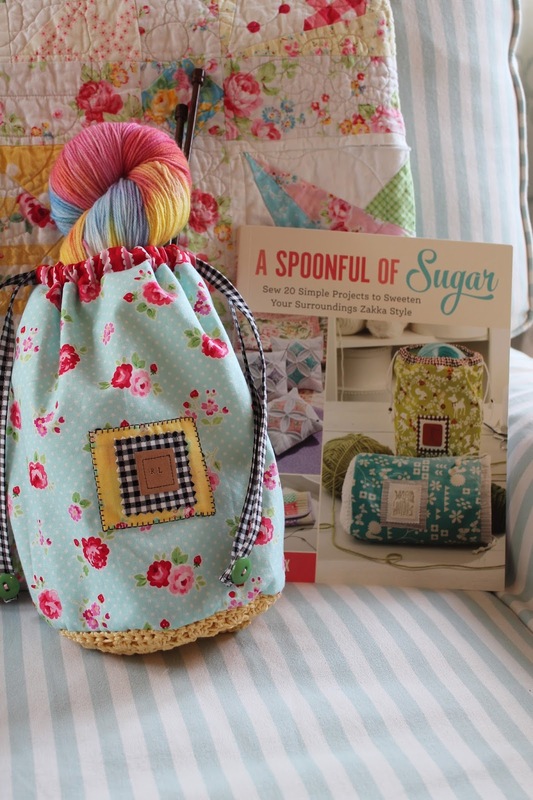 I love that purse and all of your other projects too! You have certainly made some beautiful things. I love the button box what a great find. Yes, very unstable weather here too. My poor spring flowers don't know if they should start blooming - wait - or decide to wilt due to the heat waves in between the frosty days. Love all your projects. Cute socks - love the colors. I'm trying to learn better quilting techniques, but oh patience (almost) fails me :)! 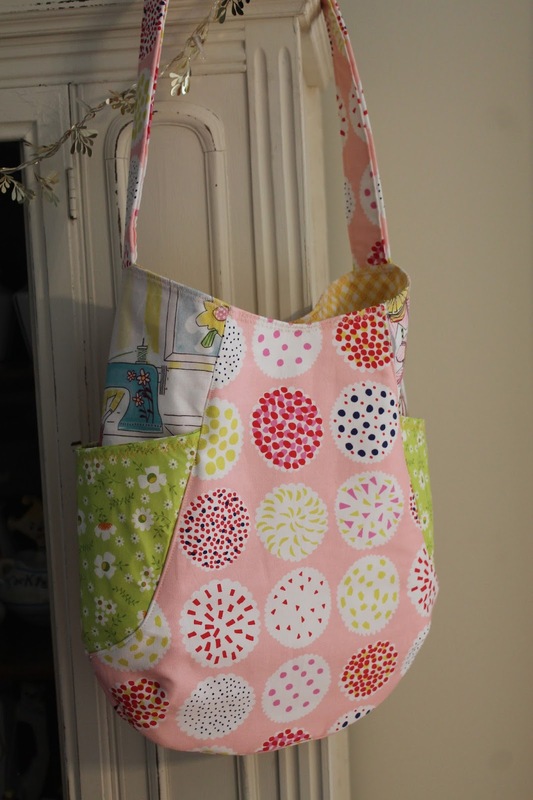 The button box is adorable, but I have to say, I love the Noodlehead bag you made! So cute! 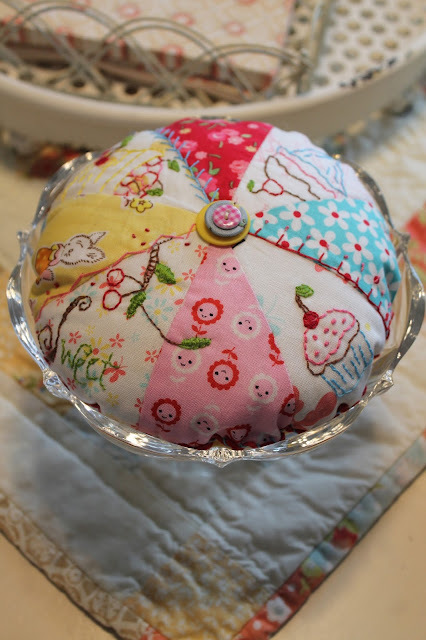 I LOVE your projects, especially the pincushion in a bowl. I'd love to see a tutorial on it. Do you make a ball, stuff it, sinch it and glue it in the bowl? So cute! 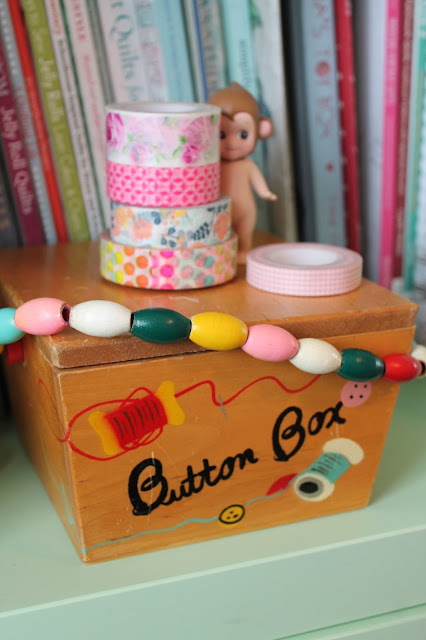 I like your button box, it reminds me of a book I have that belonged to my mother when she was a young girl. It is called "The Button Book" and is about a button box and all the adventures the buttons have when they are sewn to clothing of various children. You have sewn some fun spring projects. 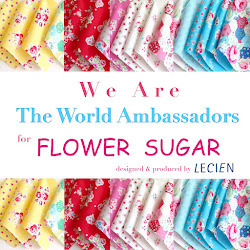 I just ordered the Spoon full of Sugar book from my library. It looks like it will have fun projects in it.